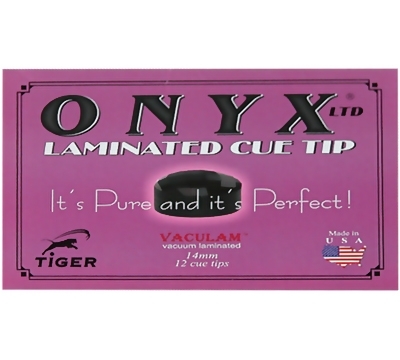 Onyx laminated cue tips are made with the same bore hides as Tiger's Sniper tips. 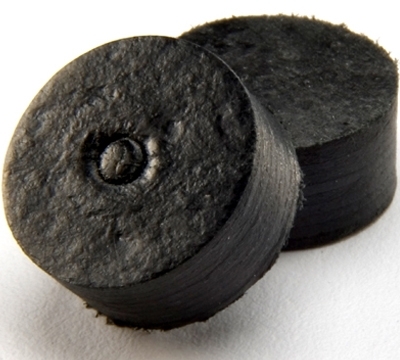 Each of the finest layers are then collected and aged with their own secret process, turning each layer to black without using a black dye. It's a very slow and time consuming process, however the end result is unbelievable to say the least. During this process, the layers are softened to a medium hardness, while making the leather firmer. It makes the tip easy to maintain and helps cut better during repairs. Onyx is the most consistent by far of any tips made. It will only be produced in limited numbers per year, since part of the natural process it goes thru, does take a long time. For those who want to have the best, Onyx is your choice, because it’s pure and it’s perfect. 14mm tip sold individually.